Tomorrow night, Colin and I are headed off to see our first opera in Paris. As such, I wanted to do something a bit fancier with my hair. So, for the last few days, I've been searching for a curling iron to help with the styling process. You wouldn't think that a curling iron would be a difficult item to find here. Heck, every backwoods Wal-Mart in the continental US has at least 5 different models from which to choose. Why would a western European nation be any different? When I finally found a curling iron that was the right size and not designed like a giant round brush, I had to buy a whole kit with multiple other attachments to get it. I suppose this kit is a good deal for people with long hair, a lot of free time on their hands, and the deep desire to look like a fashion runway victim. But, since I only meet one of the three requirements in that list (a lot of free time), I wasn't sure what I was going to do with the other attachments. Fortunately, the solution came along with my shopping buddy, Rachel. She wanted to try the straightening iron on her lovely, long red hair. 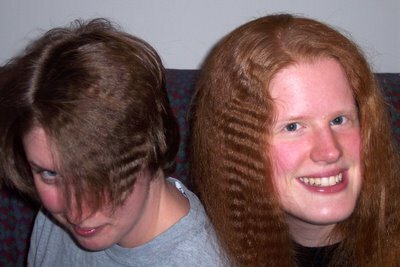 Of course, straighter hair didn't entertain us for more than a few minutes, so we decided to use the attachment that no woman should EVER use: the crimping iron. That is quite possibly the most frightening photograph I have ever seen. I graduated high school in '87, and I had a crimper. I was cool...and look where it got me. Amy, now you get to live the 80s dreams your mother never let you! Rachel, you are just too young to wear the crimped hair well, you have to have lived the era in person! Look at the way Amy has carefully pulled the hair over the eyes, a subtle but obvious salute to the punk movement. It wasn't just about having the haired crimped, it was about the attitude as well.